Many banks nowadays don’t accept coins. Many other banks will accept coins but they take a fee for sorting them. It’s a bummer but hey, at least some banks still offer good interest rates. But even as our society gains digital momentum, becoming fully digital just hasn’t happened yet. Many of us still find change ratting around in our pockets at the end of the day. Luckily, we don’t need to throw it in the trash or melt it down for scrap metal. We can instead take it to a Coinstar machine. 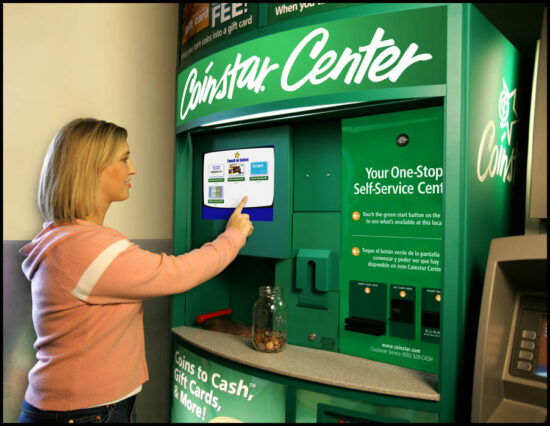 Coinstar’s are vending machines found all over major towns. You simply pour your coins into the machine and decide how you want your money converted: you have 3 options. Enter your zip code here to find a machine near you. Or you can simply Google ‘coinstar’ and Google Maps will display nearby locations. But before you do that, read about how to you can dodge those pesky fees. After all, that is the reason you’re reading this post. These machines are great. You simply pour in your change and make press a few buttons. But beware! While it’s free to exchange your change for gift cards, ($5 minimum in change required) turning your change into bills will cost you dearly. Coinstar’s fee is currently set at 10.9%. That option should never be used by any sane person. Who’s that desperate for bills, anyway? Even in dire situations, it would still be wiser to go to a store, buy something, and see if the cashier will give you some bills. 11% is a lot of money. Just make sure to sweet talk the cashier. You have a few more options beyond the gift card. You can head to a TD bank. Coinstar’s at those banks only charge 8% per coins-to-cash transaction. It’s still high but it’s better than 10.9%. Further more, you can become a customer and get access to the machine for free! The final method of avoiding the pesky 11% coinstar fee is by paying a 7.5% fee instead. This is the (max) fee you pay if you choose to donate your coins to a charity. Keep in mind these donations are a tax write-off as well. A little planning goes a long ways towards creating a financially sound life. These little methods of saving (by avoiding the 10.9% processing fee) add up overtime. Remember, saving money is not a sacrifice, it’s an investment in your future. If you read enough of these tips and tricks, you’ll find you always have more than enough money to meet your needs. I use the Coinstar machines and get the gift cards to places that I can always use: Lowe’s and Home Depot, Best Buy, Sears, and any of the local restaurants that when I don’t feel like cooking I can bring my family as a treat. I belong to a credit union and they have those machines too. They charge 5% over $100 but if you deposit the money you pay nothing. 🙂 Love my CU!